There are just a few people on Earth who could have put together the show that Larry Gagosian recently opened. Only a mega-gallery like his, with huge spaces in multiple cities, could borrow 27 Monets, including an astounding eleven from the Musée Marmottan, the Paris museum housing the largest Monet collection in the world. “Claude Monet: Late Work” is the kind of undertaking that we usually leave to institutions, and if MoMA or the Met had only borrowed those canvases and hung a banner saying MONET FROM THE MUSÉE MARMOTTAN, either would’ve had a hit. 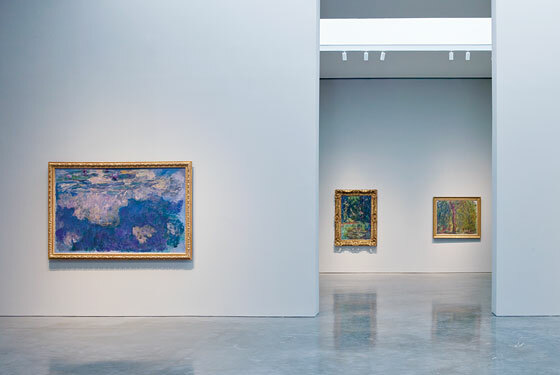 In the octagonal gallery at the front of Gagosian’s show, reunited for the first time in 101 years, are seven paintings that were part of Monet’s 1909 exhibition at the Galerie Durand-Ruel in Paris. These otherworldly things are “Les Nymphéas,” or “the Water Lilies,” in palettes of lavender, violet, pink, and purple—colors that here have the powdery presence of eye makeup. They depict the elaborate water gardens at Monet’s Giverny estate some 50 miles from Paris, and historically, they have been easy to shrug off. Remember that by 1909, Impressionism was passé; Monet was an anachronism; in Paris, Fauvism was raging and Cubism set to explode. Modern viewers sometimes wrongly see “the Water Lilies” as mere pretty decoration, nebulous and without structure, a refinement of something long since figured out. The first hints of abstraction, coming out of the late work of Cézanne, are supposed to be the great thrust forward in these years. In fact, Monet is his magnetic opposite. Where Cézanne captured and intensified shards of the eternal (every pear far more sharply defined than it could be in life), Monet portrayed the changeability and flux of every moment. “The Water Lilies” give you a jittery, amorphous sense of a world seen at the speed of light. Monet’s amazing multiple touches—flickering, fast, satiny—make sky and water flip-flop, mist and willows merge; horizon lines and logical perspective vanish; things become unmoored and seem to double and reflect themselves in this proliferating miasma of centerless space. And then he takes it even further. After 1909, Monet drastically enlarged his brushstrokes, disintegrated his images, and broke through the taming constraints and delicacy of Impressionism for good. Nineteen gnarly paintings, starting in 1909 and carrying through his final seventeen years, finish off the notion that Monet went happily ever after into lily-land. You see an artist consolidating his skills, amplifying his scale and space (one clutch of swamp grass looks like a woolly haystack), getting physical with his medium, not smoothing over his paint or covering his painterly tracks, allowing freeing expanses of unpainted canvas, pushing his subjects closer to the painting’s surfaces, and orchestrating crazily complex whirlpools of paint, motion, and color. We see the overgrown garden, a Japanese footbridge, paths thick with hanging roses, and a weeping willow. Many are rendered in overripe blues and harvest colors like rotting reds and moldy browns, with physically glutted phantasmagorias of paint. The rough allover composition isn’t looking back cozily at Impressionism; these paintings are pointed deep into the future, directly at artists like Joan Mitchell, Jackson Pollock, and Georg Baselitz. Interestingly, none of the paintings here is for sale, though cynics will scoff that the show is about whipping up the market for late Monet. (In 2008, a 1919 Monet sold at Christie’s for over $80 million.) I could certainly rehash that weary rant, but consider: This show (a) is free to the public, (b) is something no American museum has done, and (c) teaches us to see a great artist better. Get thee to Gagosian.